Kombucha ia a fermented sweetened tea (with little sugar content) that has been round for centuries. It is slightly tangy and slightly sweet with a bit of fizz you and your family will love. Its popularity has risen in the past decade. When I first taught the concept and recipes of fermenting foods for good health I was often met with blank faces. Now this stuff can be bought readily in supermarkets, gyms, the corner store and even the school canteen. It seems like we have all caught onto the fact kombucha is beneficial and here are a few claims. The only things you probably should know is that it is good for us and tastes divine. A SCOBY- purchase online (gumtree, ebay etc) or in health food stores. It is a jelly like disc which houses the living bacteria and yeast. 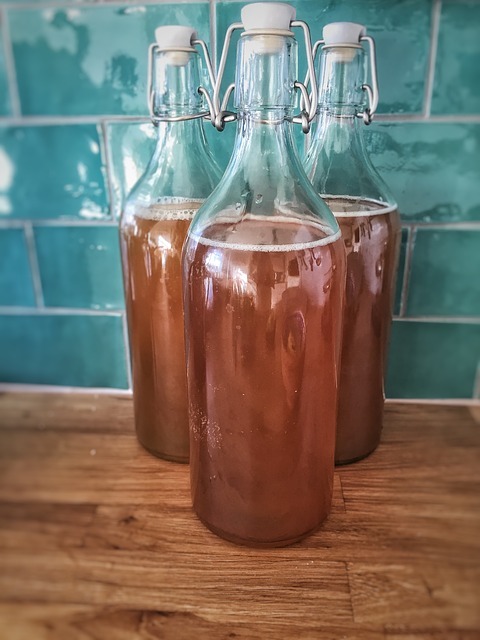 Starter Tea- purchased with the SCOBY – an acidic tea to kick start your kombucha brew. A jar preferably make of glass or ceramic. I could be any glass jar you have in your home probably best if it is 2L or more OR a continuous fermentation jar which can be purchased online holding around 9L for a continuous brew. Lastly ingredients you will have at home- tea (black or green), sugar (avoid no name brands), water. Add water and sugar to large saucepan and bring to a boil. Turn off heat and add tea bags for 15-30 minutes. Remove tea bags and allow tea to cool to room temperature – below 25 degrees celsius. In vessel add in cooled sweetened tea, SCOBY and starter liquid. Cover with a tea towel and secure with rubber band. Leave at room temperature away from sunlight for about 7 days in which time a baby scoby will form on top of tea and the bacteria and yeast will feed off the sugar. As a result you are left with a delicious slightly sour flavoured tea. A kombucha culture is made of living organisms housed in a SCOBY (Symbiotic Colony of Bacteria and Yeast). It seems like we are all aware of the benefits of yoghurt on our digestive system with the presence of lactobacillus acidophilus. The important role it plays on human health, so just imagine having that on steroids. Natural greek yoghurt contains only 1 strain of bacteria. Kombucha contains hundreds of strains of bacteria and yeasts each playing a specific role in our overall health. Ratio of starter liquid to sweet tea? You may received your SCOBY and starter tea and are probably keen to finally get going to make litres and litres of kombucha. In contrast, before getting carried away an important rule of thumb for us all to follow. 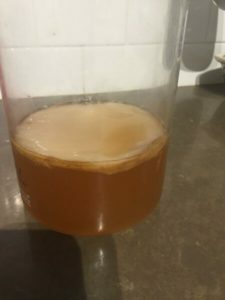 Mature kombucha starter liquid to fresh sweet tea should be no less than 1:10. If you have 100ml of starter liquid, to this add a maximum of 1L of sweetened tea. You may add less and your fermentation time in this case will shorten. Is my kombucha still alive in the winter? The timing of kombucha fermentation is very weather dependant. During the summer months for the reason that the weather is warm the fermentation period for the recipe given may be less than a week. In contrast, during the winter months it may take much longer. Your taste buds are always the best way to determine the final timing. Too sweet? Keep brewing. Too sour? It’s brewed too long and will need some sweetness added. Should I cover my brew with a lid or towel? First of all let me say, either is fine. Due to the constant production of gases I’d rather use a towel to allow the brew to breath. If for the reason that you prefer a lid, have it screwed on very loosely to allow the gases to escape. If not, as a result when opening the jar an explosion may well greet you. A first fermentation is the process the above recipe outlines. You probably will like to consume your kombucha as it. If so just bottle it in an airtight container, seal (to get the carbonation) and refrigerate. Next, the second fermentation. Certainly if you’d like to play with different flavours to add some zing to your kombucha than go for it. It usually takes 2-4 days to complete a second fermentation. Finally…. there are many, many youtube video’s which are full of great ideas, flavouring suggestions etc.